I mentioned a while back how much we are loving Jamie Oliver’s cookbooks since we moved to the UK. Save with Jamie is my current obsession, as we are eating mostly vegetarian these days and are always trying to save money on groceries. This is really a breakfast meal, but we have been serving it up for dinner on a regular basis. It has a lot of wonderful Mexican flavors but since it is a new (to me) recipe, I don’t have the usual problem of comparing it to something I used to make back home. My old recipes just don’t measure up when I try to make them with UK ingredients, mainly due to a little problem I call Lack Of Corn Tortillas. I can find ripe avocados, but they are precious at $2 each so I love this recipe for making one avocado go a long way. I was afraid I wouldn’t be able to taste the avocado when I made a dressing out of it, but the flavors really come through. The kids love these as much as we do. Made the dressing in a blender. Mix avocado, juice of 2 miles, handful of cilantro, yogurt and olive oil. Grate onion, carrot, cabbage and chili pepper with a food processor. Then toss with the dressing. Add a few whole cilantro leaves. Season with salt and pepper. Whisk all the eggs, adding a bit of water, salt and pepper. On medium low, heat a splash of olive oil. Then cook 1/4 of the egg mixture, sprinkling 1/4 of the cheese. Cook gently for about 2 minutes, only on one side. 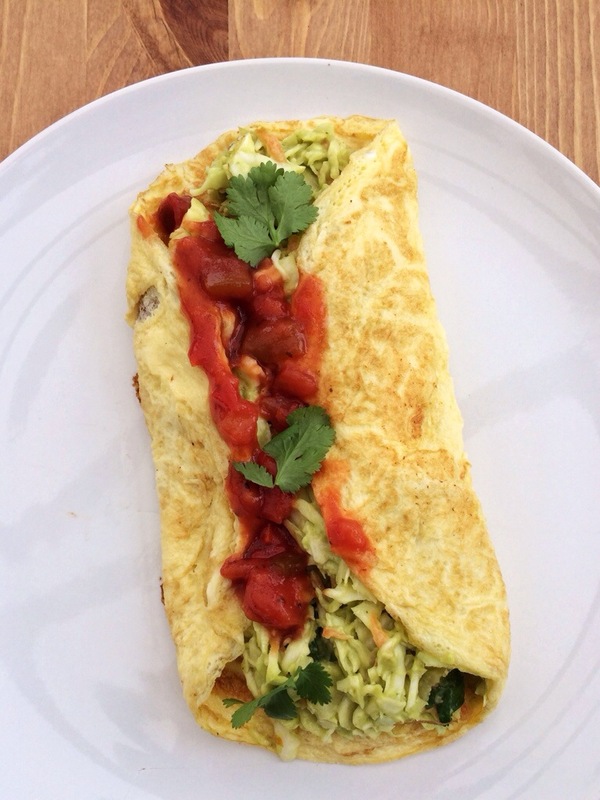 Then slide the omelette out onto a plate, spooning a quarter of the avocado slaw. 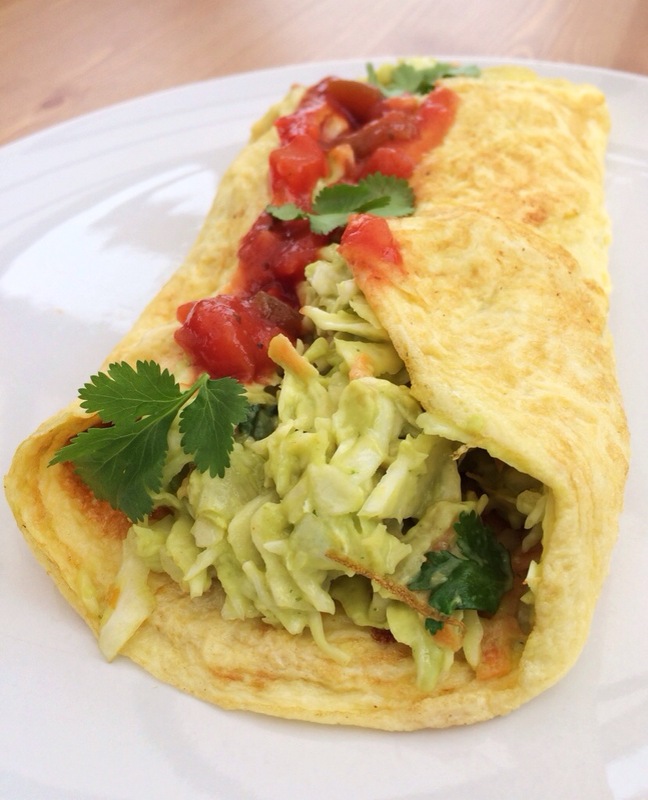 Roll the sides over and serve with a few cilantro leaves and a wedge of lime.